Jimmy’s reinstatement and return to racing did not see the end of his tribulations in 1896. In late July he failed to turn up at a meet organised by Leeds C and AC Sports. The club reported him for a breach of agreement and made a claim against him for expenses incurred in advertising the event. In August a collision with a pony trap on the North Road near Potter’s Bar while out training behind three pacemen on a triplet saw Jimmy escape relatively unscathed. The driver of the pony trap was hurt, the trap damaged, and John Jones, the first man on the triplet was hospitalised. A summons was later to be issued against Jimmy in respect of the crash and all riders concerned were fined damages and costs. Jimmy’s absence is curious. The Linton’s and the Michael’s were neighbours in the same street in Aberaman and Arthur had encouraged and trained Jimmy when he took up cycling as a boy. The funeral was attended by Choppy and Constant Huret, who wheeled Arthur’s bike, covered in crepe, behind the hearse. The words on the wreath speak volumes about the intensity of the rivalry that existed between Jimmy and Arthur. Though described in the press as modest and unassuming and not conceited by his achievements, Jimmy appears to have been a proud individual, convinced of his ability, and sensitive to criticism. His rivalry on the track with Arthur’s younger brother, Tom, was marked with acrimony on both sides, and this together with the presence of Choppy may have been the reason why he did not attend Arthur’s funeral. The bad blood was mutual, with Choppy later on record that he would die happy if his new protégé, the young rider Champion, would meet and defeat Jimmy. At the same time Jimmy was also arranging to go to America. A few days before the meeting with Johnson at Wood Green on 11 July, 1896, the South Wales Daily Post reported that Jimmy had “fixed up a foreign tour” that would add hundreds of pounds to his already bulging coffers. On 3 September Jimmy left Liverpool for the States on the Teutonic, accompanied by his new trainer, an old friend and mentor from Aberaman, John Jones. His first engagement was an exhibition match in Buffalo, New York, where he rode one mile in 1 minute, 52 seconds. On September 18 he lined up at Manhattan Beach against Frank Starbuck and A. E. Weinig for an hour race, in which Jimmy was paced by the Jallu Brothers of Paris. For the first time in America each rider had their own set of pacemen. Weinig abandoned in the twenty-first mile and despite a late surge by Starbuck in the final three miles Jimmy crossed the line in first place with a new American record of 27 miles 1690 yards. A storm interrupted the meeting, forcing the postponement of several events, and a few days later at Waverley Park, New Jersey, Jimmy made an attempt on the 5 mile record. His time of 10 minutes, 1 second, fell far short of Tom Linton’s record of 9 minutes 17 seconds set in July at Catford, but was an American record for a dirt track. It was not to be long before the American 5 mile record fell to Jimmy. At Trenton, New Jersey, on 28 September he raced at the League of American Wheelmen’s national circuit meet in front of 10,000 spectators, who witnessed Jimmy set a new record time of 9 minutes, 51 seconds. More records were to quickly follow. By October 14 Jimmy had taken the 5 mile world record from Tim Linton, posting a time of 9 minutes, 17 seconds, and 1 fifth of a second; 2 fifths of a second faster than Linton. The record was back with Linton a few days later when he posted 9 minutes 15 seconds. In turn Jimmy brought the world record down to 9 minutes, 12 seconds, at New Orleans on November 7. American records for 1 mile and world records for 2, 3, and 4 miles also tumbled under Jimmy’s relentless onslaught, while at the Coliseum races in Nashville on October 26 the American 10 mile record fell in a time of 21 minutes, 35 seconds, with Jimmy paced by triplets and singles. 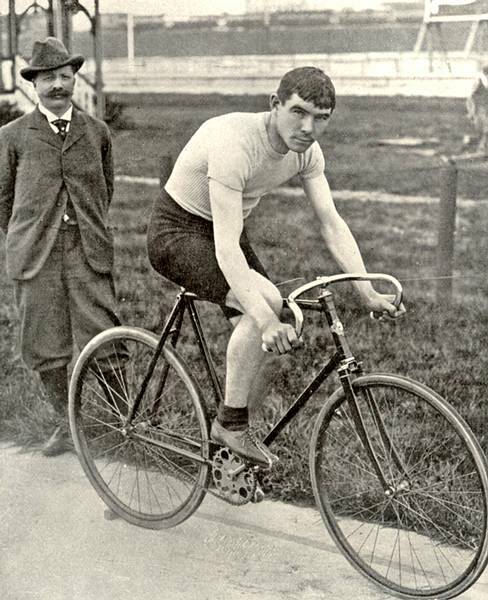 In November ‘The Roadster’, the cycling columnist for the Evening Express reported that Jimmy had decided to return to Wales, not being satisfied with his present employers, caustically remarking that “Probably, too, they are not delighted with him, as, beyond securing the American hour record, his achievements over yonder have not been by any means startling.” Jimmy’s results speak otherwise. Between September and December 1896 he set world records three times over 2 miles, four times over 4 miles, twice in each of 6, 7, and 8 miles, and three times over ten miles. On November 22 at Memphis, Tennessee, Jimmy, paced by 20 riders, broke the American hour record by nearly 2 miles, setting a distance of 29 miles, 1,293 yards, beating all American records from 11 miles upwards in the process. Over 10 miles with a flying start he set a time of 18 minutes, 33 seconds, taking him under Tom Linton’s standing start record of 18 minutes, 41 seconds. Though the results are not directly comparable due to the advantage of the flying start, the result underlined Jimmy’s ability and form. Linton meanwhile had recently extended the hour record to 30 miles, 582 yards, after losing it to J. W. Stocks in September. In November Linton, together with a group that included his brother Sam, the Scottish champion Willie Lumsden, Irishman Charlie Hale twice winner of Paris Bordeaux, and Emile Dubois, arrived in America to take part in the Madison Square Garden six-day Race. Linton hoped to renew his rivalry with Jimmy and stated that he would go for every record that Jimmy had made while in the States. Shortly after their arrival the British team’s manger, Ed Plummer, intimated that Jimmy had left Britain to avoid meeting Linton on the track. Jimmy reacted angrily, stating that in four years he had never been beaten by Tom on the track, and had in fact defeated Linton decisively on many occasions. Press reports quickly circulated of plans for the two to meet to decide the matter of which was the better rider. A series of three races was proposed with each rider to select one distance and the third, if the series stood at one-all, to be over 50 miles. The races were to be held in California and the prize money to be $5,000. The races as proposed did not come off due to the suspension of Tom Eck, Jimmy’s manager, from track privileges at that time. By late December it was being reported that Eck and Plummer had agreed that Jimmy would meet Linton at a meeting to be held in Jacksonville, Florida, in January, 1897, with the riders to compete over 1 mile, 5 miles, and 1 hour. In the meantime as Linton appeared at the six-day Race at Madison Square Garden, Jimmy took a break as the guest of Johnson in the latter’s home in Minneapolis. Two days later the Washington D.C. paper The Morning Times headline “There will be no race: Tom Eck and his numerous bicycle riders in trouble” finally sank Linton’s hopes. 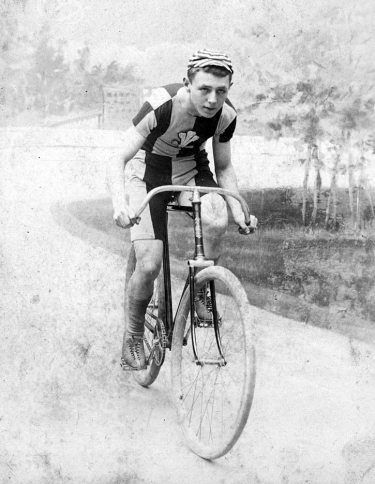 Eck’s failure to pay a $200 fine handed out by the League of American Wheelmen in connection with a breach of contract at a race in Portland, Maine, meant that he and all the riders he managed were suspended from racing, including Jimmy. By coincidence Jimmy was also in trouble with the British National Cycling Union, who had recalled him to England to answer to the charges raised against him in respect of his failure to honour his contract to appear at the Leeds meeting in July, 1896. Jimmy left for England on 13 January after issuing a statement through the American Wheelman to the effect that he had known nothing of the planned race at Jacksonville until he had received a telegram from Florida insisting on his appearance, and that he would be returning to the States within four weeks upon which he would be willing to meet Linton. With unfortunate timing Plummer had written a letter dated 13 January, 1897, demanding an explanation for Jimmy’s sudden planned departure and requesting that he wait in the States until Friday 15 January when the match could be run in Buffalo. Linton and Plummer continued to hope that a match could be arranged, in England if not in the States, but were ultimately to be disappointed. The question remains whether Jimmy wished to avoid meeting Linton on the track. He certainly knew Linton’s abilities better than anyone, having known and ridden against him from an early age, and would no doubt have had a shrewd idea of whether he was capable of beating Linton or not. Though his stated reasons for not being able to race were legitimate as he was technically under suspension as a rider managed by Tom Eck, the suspicion remains that he did in fact wish to avoid racing against Linton. Allegedly Jimmy would not race unless Eck managed him. By 6 March at the latest Jimmy was being managed by the noted trainer and manager, D. G. Shafer, which implies that his loyalty to Eck did not go that far. While he was in England the newspapers reported in January that Jimmy and Frank Starbuck had arranged a series of races to be held on his return to the States. In March, having apparently settled his differences with ‘Choppy’, reports circulated of a match to be arranged between Jimmy and ‘Choppy’s latest protégé, Champion. If Jimmy was ready to race against other successful riders in America and Europe, why not against Linton? The desire to do so was there on behalf of Linton and Plummer, while Jimmy consistently stated that he also wanted the match. We will never know if Jimmy did avoid the clash, but what is certain is that Jimmy, for all his efforts, had not managed to ride 30 miles in the hour, for which Linton held both the paced and unpaced records. Linton was widely regarded as the best long-distance rider in the world, and with a match format that allowed each rider to choose a distance, with a 50 mile race as a decider if needed, Jimmy may well have felt he had everything to lose and little to gain. “Little Michael,” Evening Express, July 27, 1896, 5th ed., 3. “Michael’s Pacers,” Evening Express November 10, 1896, 3rd ed., 3. “Death of Arthur Linton,” Merthyr Times and Dowlais Times and Aberdare Echo, August 6, 1986, 3. “Death of Arthur Linton,” Merthyr Times and Dowlais Times and Aberdare Echo, July 30, 1986, 3. South Wales Daily Post 18 March 1895, special ed., 2; “Aberdare notes,” Merthyr Times and Dowlais Times and Aberdare Echo, February 20, 1896, 5. “Cycling,” South Wales Daily Post, February 12, 1897, extra special ed., 2. “Cycling,” South Wales Daily Post, July 7, 1896, 2nd ed., 2. “Interesting items of news about football, cricket, and cycling in Wales,” Evening Express, September 5, 1896, extra special ed., 2. “Quill club meet today,” The Evening Times (Washington, D.C.), September 18, 1896, 3. Evening Express, September 29, 1896, pink ed., 2. ; “On the wheel,” Los Angeles Herald (California), September 25, 1896, 2. “Cycling,” Evening Express, October 10, 1896, extra football ed., 2. “Local sport.” Evening Express, November 26, 3rd ed., 3. “Cycling,” Evening Express, October 10, 1896, extra football ed., 2; “Michael in America,” Evening Express, October 24, 1896, 3rd ed., 4. 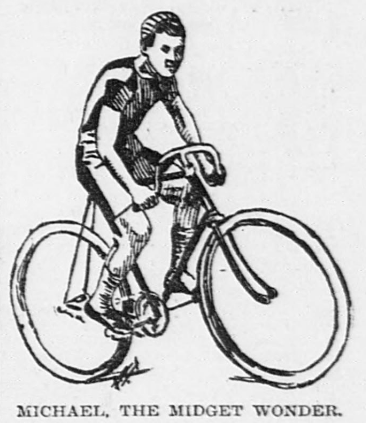 “Cycling notes,” Evening Express, November 9, 1896, pink ed., 2. “Bicycling in America,” Evening Express, December 19, 1896, 3rd ed., 3. “News of the wheelmen,” The Sun (New York, NY) November 23, 1896, 9; “Cycling,” South Wales Daily Post, December 10, 1896, 2. “The brothers Linton,” Evening Express, December 5, 1896, 5th ed., 2. “Tom Linton going to America,” Evening Express, November 19, 1896, 1st ed., 2; “English riders arrive,” The Morning Times (Washington, D.C.), November 29, 1896, 7. “English riders arrive,” The Morning Times (Washington, D.C.), November 29, 1896, 7. “Gossip for cyclists,” The Saint Paul Globe (St. Paul, Minnesota), December 21, 1896, 5. “Notes of the wheel,” The Evening Times (Washington, D.C.), December 2, 1896, 3. “Sports in general,” The Morning Times (Washington, D.C.), December 21, 1896, 3; “Cycling Notes,” Evening Express, January 11, 1897, pink ed., 4. “Michael is a midget,” The Saint Paul Globe (St. Paul, Minnesota), December 8, 1896, 3. “Hale still in the lead,” The Sun (New York, NY), December 09, 1896, 4. “The English manager,” Evening Star (Washington, D.C.), December 26, 1896, 9. “Extra! The great international six-day bicycle race …,” The Morning Times (Washington, D.C.), December 28, 1896, 6. 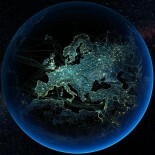 “The night scene, The Morning Times. (Washington, D.C.), 29 Dec. 1896, 3; “Records lowered,” The Morning Times. (Washington, D.C.), 30 Dec. 1896, 3; “Records smashed,” The Morning Times. (Washington, D.C.), 31 Dec. 1896, 3; “New records made,” The Morning Times. (Washington, D.C.), 01 Jan. 1897, 3; “New records made,” The Morning Times. (Washington, D.C.), 02 Jan. 1897, 2; “Linton breaks his record,” The Morning Times. (Washington, D.C.), 03 Jan. 1897, 7. “Remain in town,” The Morning Times. (Washington, D.C.), 04 Jan. 1897, 3. “There will be no race: Tom Eck and his numerous bicycle riders in trouble,” The Morning Times. (Washington, D.C.), 06 Jan. 1897, 3. “Michael talks of Linton,” The Morning Times (Washington, D.C.), January 10, 1987, 7. “Michael will meet Linton,” The Morning Times (Washington, D.C.), January 14, 1987, 3. Evening Express, January 26, 1897, pink ed., 1. “Indefinitely postponed,” The Wheeling Daily Intelligencer. (Wheeling, W. Va.), January 9, 1897, 3. “The Wheelmen,” The San Francisco Call. (San Francisco [Calif.]), March 6, 1897, 8. “Michael-Starbuck matched,” Kansas City Daily Journal. (Kansas City, Mo. ), January 31, 1897, 5. “Linton and Champion,” Evening Express, March 3, 1897, extra special ed., 2. This entry was posted on October 12, 2014 by aaroncripps in America, Britain, Cycling, History, Nineteenth Century, People, Wales, Welsh and tagged Cycling, Cyclist, James Michael, Jimmy Michael, Little Jimmy, The Midget Cyclist, Track Cycling, Wales, Welsh History, World Champion.